#GivingTuesday is a global day of giving that harnesses the collective power of individuals, communities and organizations to encourage philanthropy and to celebrate generosity worldwide. Each year Renown Health helps welcome 4,000 babies into our communities. Last year, 549 premature or sick infants needed additional, round-the-clock care before heading home. These newborns won’t remember their time in the Neonatal Intensive Care Unit (NICU), but we are proud to provide a warm, welcoming and nurturing environment that makes a significant difference to their care, and to their parents. As the community’s only not-for-profit hospital, Renown Children’s Hospital relies on philanthropic support and partnerships from our community to provide services like the NICU to our region. 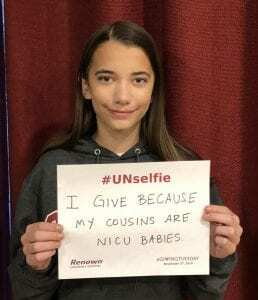 Previous post: #VoteforMiracles Nov. 27 – Dec. 18 and Renown Children’s Hospital Could win $50k from Credit Unions for Kids!